Instead of traveling to Russia with mom and dad, 10-year-old Alex and his nine-year-old sister Katie are stuck in a creepy old house with their weird Aunt Karina. Alex thinks that his summer is ruined. But then the kids discover a portal that leads them into the magical world of the Firebird. That world quickly becomes dangerous. The kids search for the way back, but instead find Baba Yaga, the Russian witch. “We got a little lost,” Alex says to Baba Yaga. ”And now you may get a little eaten!” she responds. Can Alex and Katie get back to their aunt's house? Or will they become Baba Yaga's latest victims? Awesome witch cackles and voicing by the narrator! What did you love best about Firebird: Adventure One? Book 1 of the Firebird series is a special treat. Actress Rebecca Lea McCarthy gives a dramatic performance of this thrilling fairy tale/fantasy. McCarthy’s deliverance is much more than a narration. It is vocal acting that fits perfectly with the storyline which is perfect for young children and thrilling enough for adults. Imagine a portal to a fantasy realm complete with a mean witch and a beautiful and magical bird. The combination of Julia Gousseva’s brilliant writing and the vivid portrayal of all the characters by Rebecca Lea McCarthy has created a wonderful and magical adventure. The kids and I enjoyed listening to this modern version of the Firebird, a Russian fairy tale. Their adventures into the magical land, their encounter with the Russian witch (Baba Yaga) and their search for the healing feather that would help their weird Aunt Karina were exciting. Rebecca Lea McCarthy did a fantastic job with all the different voices. We especially liked Aunt Karina and Baba Yaga, but all the voices are distinct and memorable. We hope the series continues! What made the experience of listening to Firebird: Adventure One the most enjoyable? The variations in the voice of the narrator made me perk my ears in anticipation for the next twist in the story. What other book might you compare Firebird: Adventure One to and why? This book is similar in theme to other books by the same author, Julia Gousseva, in that it delivers cultural themes with a tender care to the next generation, to children who may not have had the opportunity to absorb their Russian heritage and all the wonderful legends it encompasses. An example would be Lollipop by Julia Gousseva. I hope that this book, too, would be produced as an audiobook. What about Rebecca Lea McCarthy’s performance did you like? The voice of Rebecca Lee McCarthy has a freshness about it, especially when expressing the children's voices in an exchange between them. She fleshes out every nuance, every word in the story, creating not only an intrigue but an magic atmosphere as well. This is an admirable undertaking, striving to update one of the most fascinating fairytales in literature, and make it accessible to young readers. Framed in the here and now, this is a journey of discovery, starting with two kids, Alex and Katie, coming to spend the summer with their weird relative, aunt Karina.In her house, a door engraved with foxes and bears leads into a musty library, where Katie discovers an old thick book, a book of Russian fairytale. It is here the kids learn about the Firebird. It is a creature of marvel, traditionally described as having majestic plumage that glows ever so brightly. Its feathers are magical, they can heal pain--but they lose their power if captured by force. Here is a great lesson to be learned.Alex, skeptical of the powers of magic, lays his hand on the canvas of a painting, and his hand goes through, which is when he finds himself in the middle of the meadow, looking back at his sister who remains on the other side, in the realm of reality. It is then that he understands that the painting is a portal into a world of adventure.The kids go on a quest, to bring the magical feather to heal Aunt Karina's pain. But first, she warns them of two things: the feather must be given freely by the Firebird, and they must refrain from talking to old ladies, especially the Baba Yaga, the witch who eats children. Will the follow these instructions? Will the survive the journey, and bring back the magical feather?In reading this book, my only reservation is this: when writing flashbacks from a moment in the past to time before that, a writer should make use of the 'past perfect' tense, which help make the distinction between time periods. Overall, having heard many Russian stories in my childhood, I find Firebird enchanting. Would you listen to Firebird: Adventure One again? Why? Children's books have changed a great deal from when I was a kid. Although there are a ton of great books out there today, sometimes I feel as if the literature has been removed from Children's lit. That is one of the biggest reasons why I fell in love with "FireBird". The fairy tales are back as two children, Alex and Kate, become lost in a magical realm. We journey along with them as they fight to find their way back home. A wonderful story and a great way to introduce kids to world literature. 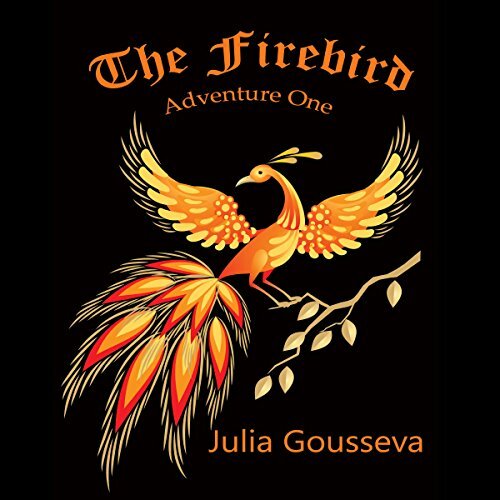 The Firebird is a well-known character in most East European folklore, and this modern version of the story, especially with such a fantastic narrator, makes it easy for the kids to relate to it. I'm not a kid but I immensely enjoyed the story, too. Firebird is based on Russian folk tales. The story is off two young children shuttled off to an elderly aunt while their parents return to Russia to deal with a crisis. The aunt is old and had difficulty moving around so the kids are less than thrilled to be stuck with her and not going to Russia with their parents. They pass the time listening to the folk tale of the Firebird and the magic properties of it’s brilliant feathers. Alex, the elder of the two children, is bored. His attitude changes though when he and his sister, Katie, find a magic portal. Their aunt tells them they can go through the portal but warns them of the dangers. The primary danger is old ladies are not always nice so to avoid them and certainly do not talk to them. Alex and Katie enter the portal and their adventure begins. They have several run ins with a not so nice old lady (Baba Yaga) and meet the firebird. Firebird was a quick story that young children will love. At least my children would have. The story has suspense and a few scary moments but not too scary for the grammar school crowd. I would hesitate for any child younger than five unless they had a good understanding of reality vs fantasy. The production values were good. The narrator Rebecca Lea McCarthy did a nice job with the voices. Alex, the young boy, is distinct from his younger sister, Katie. The aunt is distinct from Baba Yaga. I had no trouble following which character was speaking and I do not think a child would either. Firebird is the first of five adventures Alex and Katie share. If your child enjoyed the Magic Tree House series, this should be right up their alley. The big bonus with this series is exposing your child to the myths and folklore of another culture. If you are Russian, this would be a great starting point for sharing the folktales of your culture.